I like cheese. I like wine. I like cider and beer too, so when my parents suggested going to their favourite cheese shop for my birthday treat, I leapt at the chance. 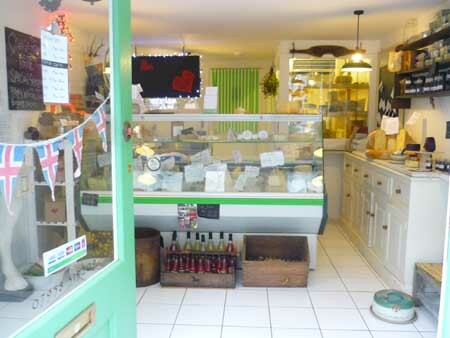 It’s called The Cheese Box, and it’s in Whitstable, Kent; probably the prettiest of the towns on the north Kent coast. In an area famous for its seafood, The Cheese Box stands out. As you can see from the picture, its quite a small shop, not an awful lot of room, but the shelves are packed with relish, Kentish cider and wine, and on the floor were crates full of freshly-made bread. They only sell British cheeses, a lot of which are local to the area. The staff are incredibly helpful, and clearly love the cheese that they are selling. It’s quite an easy place to get to, just off the M2, and the shop is within walking distance of any of the car parks in the town centre. Most visitors to Kent don’t get far beyond Canterbury, but that’s far too commercial and Dickens-ised, so if you’re in the area just go the extra 10 minutes up the road. You won’t regret it, unless you go on a Tuesday when they’re closed. That’s enough about the shop, let’s talk about the cheeses. We bought three cheeses, one of which is a blue to melt on some steak tonight. We tasted a few harder, nuttier blues, but settled for the Oxford Blue, as hopefully it will melt better. It’s made from cow’s milk, based on a brie recipe, so it’s very creamy, and I imagine if we left it for a few hours it would collapse entirely, but I doubt it will last that long. I prefer the Oxford Blue to the more local Kentish blue as the flavour is more subtle, even when the cheese is a bit older. Should be absolutely gorgeous on a steak, I’ll have to update this post later. The other two cheeses are actually the same, but one is smoked. Winterdale Shaw is billed as Kent’s very own cheddar, but the cheese is a lot more complex than that. Nuttier, certainly, with a cleansing hint of citrus fruit. The taster we had of the smoked Winterdale Shaw was mind-blowing; it’s smoked over oak chippings and stays moist and firm. Only had a taster so far, so keep an eye out for the update. All in all, a very successful two-hour round trip to Whitstable. If you want to check out the website for The Cheese Box, you can get to it here. In the evenings it turns in to a Cheese Bar, which sounds incredible, and they have an old Citroen H Van that drives around North Kent selling the same selection of cheeses as the shop. They also deliver, so if you live miles away from Whitstable but wish to try some local cheeses, they offer a very good deal on delivery. I just love cheese so much!